Chronology isn't usually a big deal in videogames; timelines tend to go in one direction - forwards - and each game in a series pushes the overall narrative a little further along. Every now and then, a prequel will crop up, but they tend to be pretty well sign-posted and it's simple to slot them into their proper chronological place. This is emphatically not the case when it comes to the Legend of Zelda games, however, which leap erratically - and confusingly - forward and back in time like an indecisive DeLorean. Both the series' creator, Shigeru Miyamoto, and its current overseer, Eiji Aonuma, have said that the series does have a fixed timeline, but they're rather reluctant to tell anyone what it is. Naturally, this has led to a great deal of debate about what the proper order is, partially because it's a fantastic puzzle, but also because it's Zelda. It's hard to imagine people putting in this kind of effort for most games, but the Zelda franchise has spanned 25 years, and legions of people have grown up playing the games. It doesn't matter if they started as early as the original Legend of Zelda, or as late as Twilight Princess or even Spirit Tracks, they all share a deep love for the oft-threatened Kingdom of Hyrule. 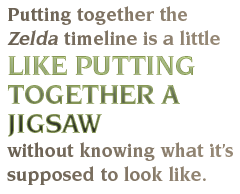 They need it too, as putting together the Zelda timeline is a little like putting together a jigsaw without knowing what it's supposed to look like. Would-be Zelda historians aren't working completely in the dark, however; from time to time, someone at Nintendo will describe a part of the jigsaw, either confirming or debunking a theory, or adding a new twist that no one had ever considered before. For example, some fans believed that the green-clad hero in the various Zelda games was the same person each time, not unlike Mario in the Super Mario games. Unfortunately for the idea's supporters, Shigeru Miyamoto demolished it in a 2003 interview with Nintendo Power, when he said that the series actually featured a multitude of green-clad heroes called Link. Nintendo later confirmed this in the opening to Wind Waker, which refers to the legendary "Hero of Time," the title given to the Link from Ocarina of Time. This revelation not only changed the thinking about the timeline, but it also led to the rise of the "Multiple Ganon" theory, which suggested that if there were multiple Links in the series - and multiple Princess Zeldas too - then perhaps the series' villain was a new incarnation each time, as well. This is yet to be confirmed or denied by Nintendo, but it does help explain why the series' perennial villain seems so very hard to kill. Unfortunately, the information that Nintendo allows to trickle out can sometimes raise more questions than it answers. In 1998, Shigeru Miyamoto - again talking to Nintendo Power - said that A Link to the Past came after Adventure of Link chronologically. This caused confusion amongst fans, because Ganon died in the original Legend of Zelda, and remained dead in Adventure of Link. No one knew how Ganon was supposed to have come back to life, and the back story for A Link to the Past made no mention of it. Even more confusingly, several pieces of promotional material for A Link to the Past said that it was set "generations" before its predecessors. There are a number of schools of thought regarding why the "Miyamoto Order," as it's known, doesn't seem to match up with information in the games. Some believe it's because of translation problems, others think that it's a mistake, and some think that Miyamoto - who has previously stated that he values gameplay a lot more than story - didn't really care about the timeline. Whatever the reason, the Miyamoto Order is now largely ignored.